Cottage ChicVintage Fabric Creations for you and your home! 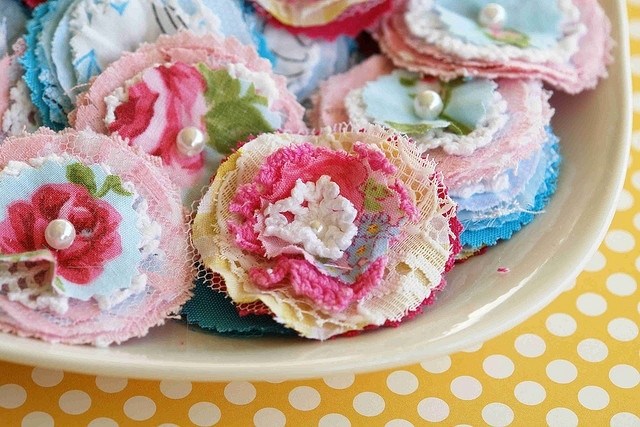 I absolutely love these little vintage fabric and lace flowers. They are perfect for just about everything…you can create hair pieces for every age…magnets…clips…pushpins…you can embellish just about anything you can think of with the…create your own cottage style artwork…clip them on shoes…make brooches…put a bit of a cottage spin on placemats…napkins…everywhere! This didn’t come with a DIY…but as you can see…it is made of different size circles…each a tiny bit smaller than the other…layer will all kind of fabric patterns…scatter a touch of lace…netting…crochet rounds and more…once you have them stacked you sew directly in the center with a bead…pearl…button…etc…and attach them…pulling really tightly in the center. What you will get is a beautiful bloom…be careful…you will probably get addicted! ENJOY! 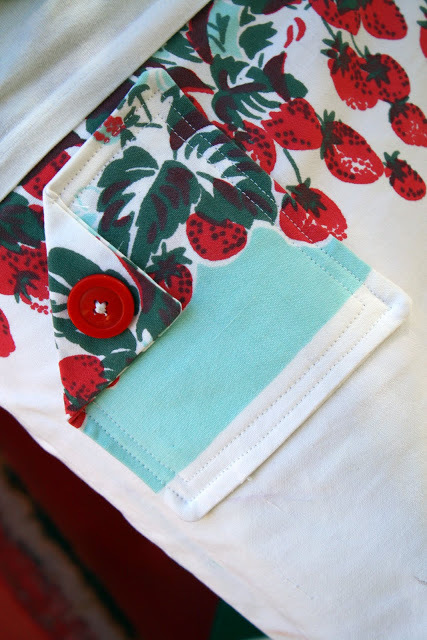 you will get the DIY for this adorable Vintage Strawberry Skirt made from a vintage tablecloth! You have to go take a peek! 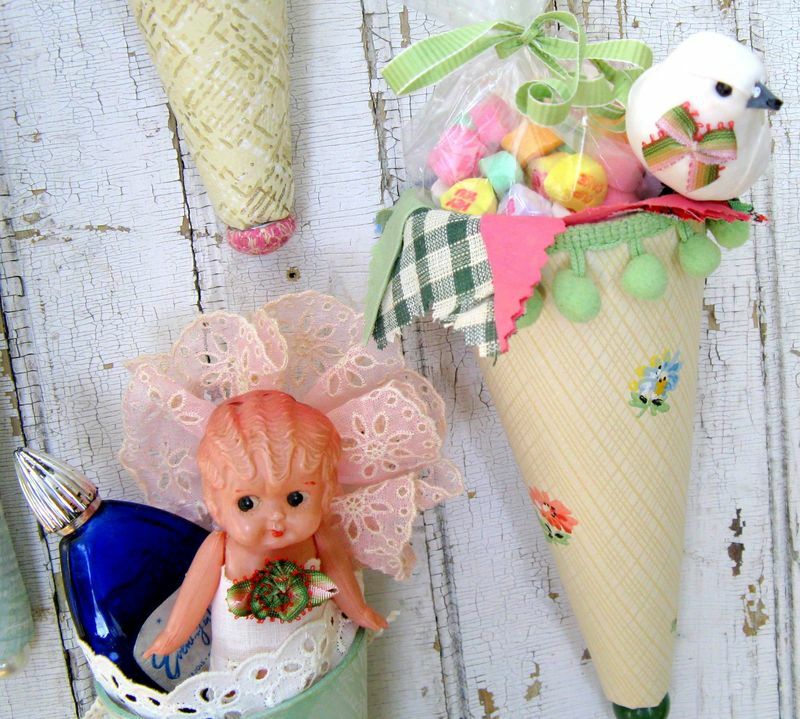 creates some wonderful and whimsical cones made with vintage fabrics with vintage bits and bobs! How much fun are these and you can create your own originals! Fill them with your favorite little items…hang them everywhere…each one different…each one precious. Mitzi shares the DIY with you…have a peek and start creating. Oh these are so fabulous for the holidays…but great every day. 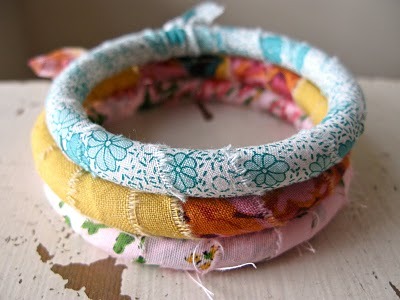 creates these beautiful vintage Hankie Bracelets. What a great way to take a family heirloom and use it all the time…it’s almost like having Grandma with you : ) I love these and of course you don’t have to have vintage hankies to make them…but they sure have tons of character! Get the DIY…you will want to make them for everyone. what is so great about these is you don’t need a lot of one fabric….just a bit will do…wrap it…tie it…wear it! What a great craft for the tweenies to make with their friends. 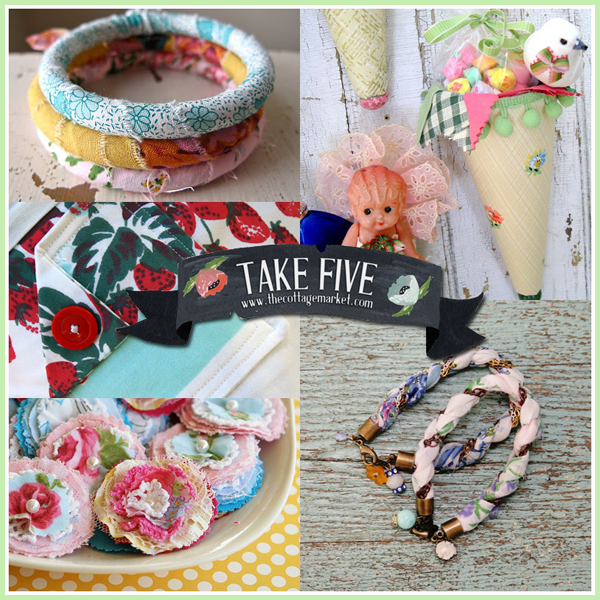 These are for all ages…you are going to want to make dozens of these fabric bangles…hope you all have fun. Hope you try them ALL!!! I love all these, thanks! I love vintage fabrics too–and so fun to see what people do with them! neat stuff! 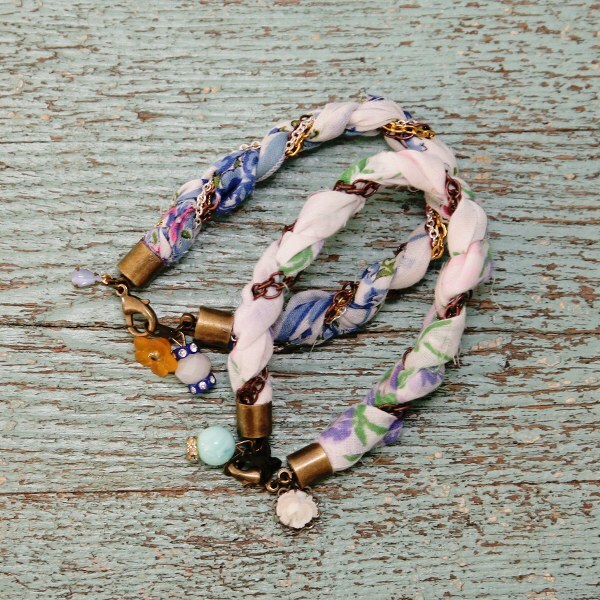 love the little flowers and the bracelets. THanks for sharing adn have a great weekend!